The L-Dens 313 density transmitter. ANTON Paar has launched the L-Dens 313 density transmitter for continuously measuring the density and concentration of liquids, whether for large production plants or on a small scale. 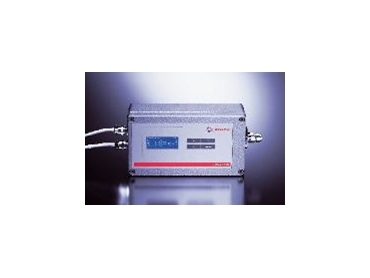 Available from B-R Controls , the transmitter automatically calculates the temperature-compensated density of the process sample and displays the results on a four-line LCD. The system also provides an option to convert the measured density to a concentration in either Brix, Plato, % alcohol, API Gravity, or any other user-defined value, as required. As well as displaying the results the unit can also transfer the data via standard interfaces (mA outputs, relay contacts, Profibus option). All wetted parts are constructed from stainless steel which makes the L-Dens 313 compatible with most samples found in industrial applications. The instrument is suitable for continuous measurement of the density or concentration of samples that require an accuracy of 0.001g/cm3. The compact transmitter is a powerful measuring instrument which can be integrated quickly and easily into measuring systems and plants. The L-Dens is a practical, user friendly and affordable instrument that enables process monitoring for even small scale operators, research organisations, and processes at the pilot plant stage.